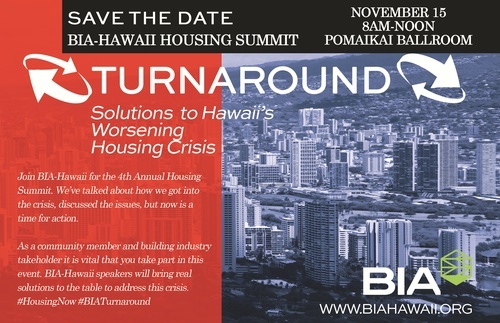 The 4th Annual BIA-Hawaii Housing Summit will tackle how the industry, in cooperation with other stakeholders, can turn the housing deficit around in the coming year. Speakers and panelists will provide attendees with examples from around the country. This informative session will provide a path to increasing the quantity of housing at all price points. Very often, initiatives and plans develop from this summit to become new legislation. Be a part of the solution and learn more about what we can do as industry members to move the needle and progress. Download event flyer here. *November 9 is the last day to cancel and receive a full refund. Any cancellations after that date will not be processed for refunds.